00:11 clavi what are the pros/cons of redis and postgres for servers? 00:16 clavi e.g. reliability - "good" vs "very good"
00:17 clavi and I can make database backups while the server is running, right? 00:18 blaise as opposed to litesql? 00:18 blaise can't they use the same db file? 00:23 clavi is postgres support compiled in by default? 00:59 Calinou progysm: is it an IPv4 or IPv6? 01:17 progysm they send media with curl? 01:24 jordan4ibanez How does one add sounds to clientmods? 01:32 artimax Has anybody successfully ran a minetest server on CentOS? 01:33 blaise artimax: not even on the localhost? 01:35 artimax what am i looking for? 01:38 progysm Lone-Star, can you connect to minetest.progysm.com 30000 ? 02:14 Lone-Star progysm: is this a home server? 02:15 progysm I won't annouce it on the server list until I hack a lot of modules..
03:38 jas_ so i go to test a thing, real quick, so i spawn a fresh world and i'm suddenly greeted with all this text, and a form to boot! https://i.imgur.com/4DEX2HC.png i must have stared at it here for a good minute before thinking, "i'll just hit one of the buttons and see what happens" -- fortunately, it worked and i was able to get into the game and test my mod. 04:27 blaise jas_: could you imagine being confronted with that prompt after building on a server for 5 years? 04:29 jas_ what's Phoenix Theory? 04:30 dogetest which mod should I use for 3d armor? 04:36 dogetest how to clone the specific .5.0 branch? 04:44 blaise but I wonder if others think if I do good work? 04:44 blaise and if there is something I could do to make it better? 04:46 blaise jas_: What seems to be the problem? 04:47 jas_ i don't know what that is, and after ten or fifteen seconds on that page, i don't want to either. 04:48 jas_ why did you paste it? what is it in reference to? 04:50 blaise I know, I was making a pretty dry joke..
04:50 blaise I was refrencing actual physics..
04:55 jas_ it whispered, "we're watching you"
04:56 blaise jas_: would you care to make that dream a reality? 04:56 jas_ you want me to farm a cotton field on your server? 06:11 aidalgol Greetings, fellow blockheads! 09:35 aidalgol Where is the minetest user config file/folder? I'm surprised this isn't in the FAQ. 21:35 progysm so how do you build a small duck ? 21:46 t20kdc ...the duck's called Ping? 21:54 progysm the duck has only one leg? 21:57 progysm and why are the wings not in the same material that the feathers? 22:15 dogetest is master branch 0.5? 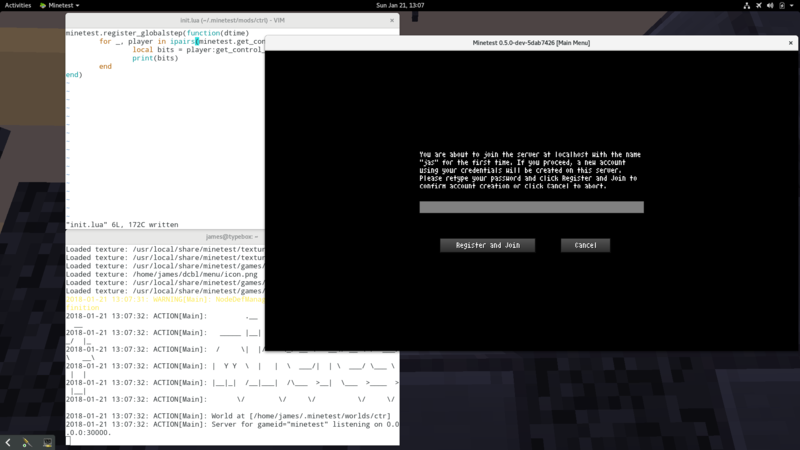 22:17 dogetest I'm linking sfan5's build server for windows users. Where should I send unix users? 22:19 dogetest so, master branch? 23:00 adfeno Calinou dogetest progysm: I think GNU Guix provides distro independent package.